Our research team visited Tatooine (Figure 1) to conduct an extensive biological, paleontological, and sociological survey of the planet. The biology, behavior and diet of herbivorous banthas was examined through wild observation and captive trials. Members of indigenous species were extensively interviewed about their records and cultural memories of the ecosystem and wildlife of Tatooine. Krayt dragon skeletons were analyzed to determine their past biology and behavior. 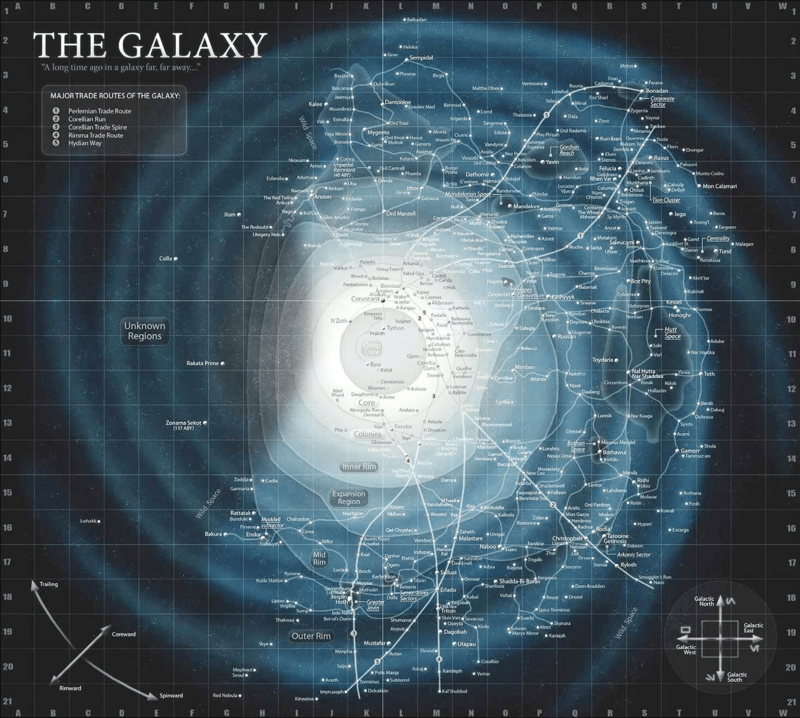 Figure 1: Study site of Tatooine is located on R18 of this map. Krayt dragons (Figure 2) are now mostly extinct (source). Our data, a combination of historical records from colonists, wild population surveys, and interviews with indigenous populations, suggests that wild populations have declined by more than 97% since the days before human colonization of Tatooine. Stable isotope analysis performed on skeletons suggest that Krayt dragon diets consisted primarily of herbivorous banthas. Figure 2: The bones in the background of this shot from the documentary “A New Hope” are a Krayt Dragon skeleton. While Republic citizens are frequently dismissive of Tatooine (Master Skywalker said of Tatooine “if there’s a bright center to the universe, you’re on the planet that it’s farthest from,” ) indigenous sentient species sadly point out that it wasn’t always this way. “Oh, Tatooine was a beautiful place,” a Jawa Clan Chief told us in an interview that was frequently interrupted by attempts to sell us broken pieces of technology. “Lush forests, a huge ocean full of fish to eat, it was a paradise.” The Jawas now roam Tatooine in huge terrestrial vehicles known as “sandcrawlers” that keep them out of the heat, but the Clan Chief told us that these vehicles were originally designed to allow Jawas to safely move between trading posts without being attacked by Krayt dragons. “We haven’t seen a Krayt in generations, though,” he told us. He also told us of many beautiful and fascinating species of plants and animals that lived in the now-gone forests, all extinct now due to desertification. 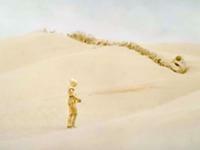 Interviews with Tusken Raiders proved complex, as the species is distrustful of (and hostile to) foreigners, but a Tusken Storyteller we interviewed blamed ancient offworld “outlander” colonists for the destruction of the natural resources of Tatooine and the resulting changes in their species’ culture. Tusken Raiders were not always a nomadic desert people, and they long ago (then called Ghorfa) had vast settlements with a high standard of living and relatively advanced technology (source). A group of offworlders that Tuskens call “the builders” changed that, disrupting Tattooine’s ecosystem and necessitating a switch to a nomadic lifestyle with a much lower standard of living. The Storyteller told us that his species valued (some tribes even worshipped) Krayt dragons, and were devastated to witness offworlders killing them on such a large scale. Bantha populations quickly began to increase, he reported, and Tuskens learned to domesticate some of them. Bantha numbers grew out of control, and the Storyteller relayed a Tusken fable, similar to the Earth tale of greed killing the goose that laid golden eggs, that suggested that ancient Bantha overgrazing helped turn Tatooine into the desert world it is today. (Paleontological records agree that bantha populations greatly increased, between 1,000 and 25,000%, shortly after the arrival of humans). 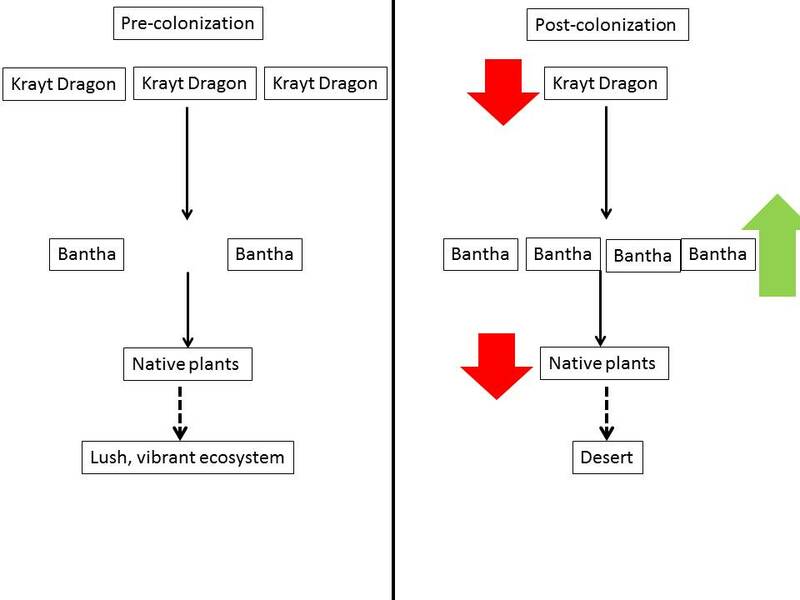 These results suggest an trophic cascade: that the extirpation of apex predatory Krayt dragons by early offworld settlers caused predation release in herbivorous banthas, which overgrazed native flora until a tipping point was reached and Tatooine experienced desertification (Figure 3). Figure 3: Hypothesized effects of the loss of apex predatory Krayt dragons on a simplified Tatooine ecosystem. Red down arrows indicate population declines since pre-colonial times, and green upward arrows indicate population increases. Our results suggest that unsustainable predator culls by ancient offworld colonists may be to blame for the desertification of Tatooine, as well as the resulting biodiversity loss and cultural changes in indigenous sentient species. This has important consequences in the ongoing debate over the historical legacy of the Colonization Act and attempts by some Core World political leaders to reinstate it in the New Republic. Though strict regulations surround the use of terraforming technology on an inhabited world, less care is taken to ensure that colonist activities have a minimal unintentional impact on the native biosphere of colonized planets. The authors would like to thank the General Ministry of the New Republic for their funding of this research expedition, two anonymous reviewers for their helpful feedback in improving this manuscript, and Matt Shipman for organizing this special collection of research related to Tatooine.